the Faculty of Medicine at Shimane University in Japan. were 18.7 ± 1.0 years. as addict (including probable addict). 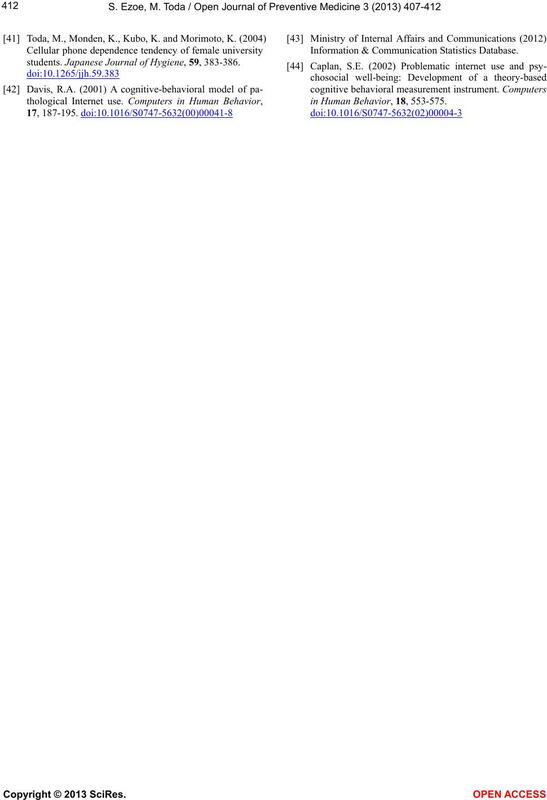 cating a high level of loneliness. [35,36], which was designed for a Japanese population. Table 1 shows the results for each questionnaire. 38.4), while the frequency of addict students was 42.9%. 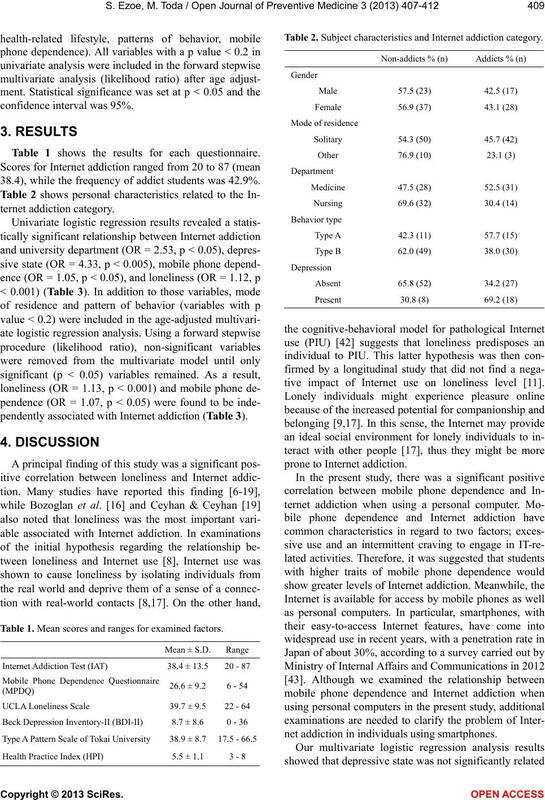 pendently associated with Internet addiction (Table 3). Table 1. Mean scores and ranges for examined factors. Table 2. Subject characteristics and Internet addiction category. tive impact of Internet use on loneliness level . 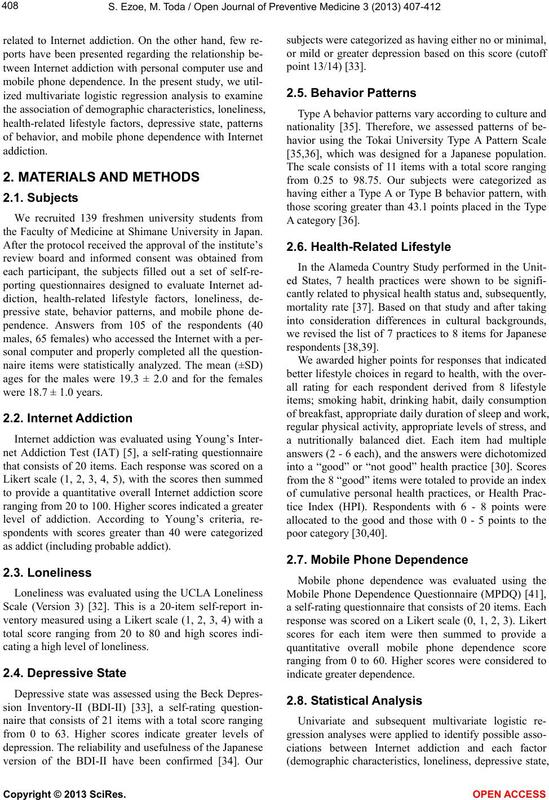 net addiction in individuals using smartphones. Table 3. 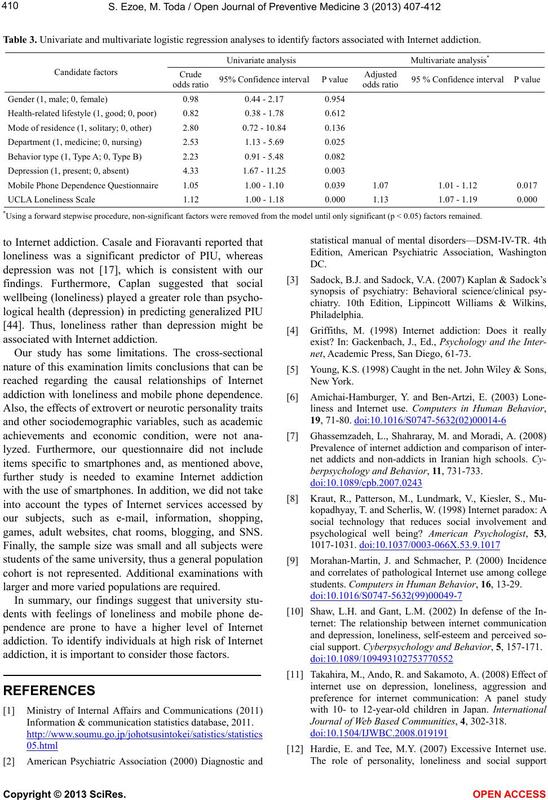 Univariate and multivariate logistic regression analyses to identify factors associated with Internet addiction. *Using a forward stepwise procedure, non-significant factors were removed from the model until only significant (p < 0.05) factors remained. 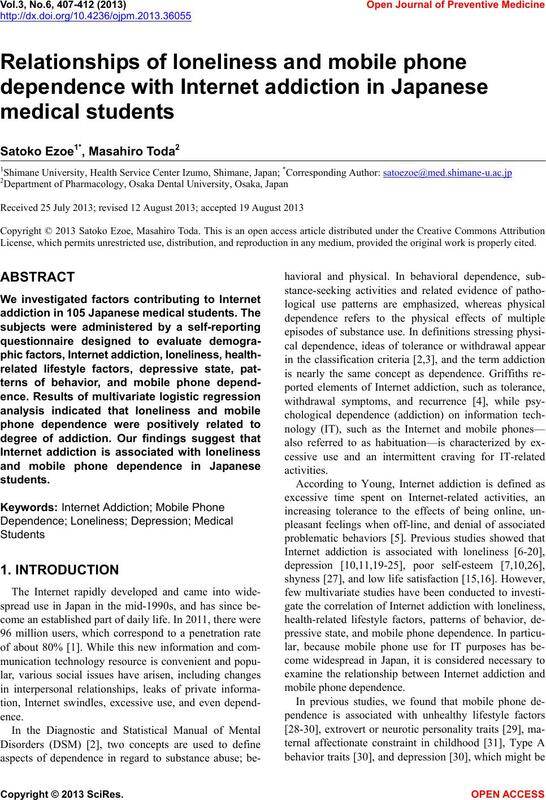 addiction with loneliness and mobile phone dependence. games, adult websites, chat rooms, blogging, and SNS. larger and more varied populations are required. addiction, it is important to consider those factors. Information & communication statistics database, 2011.
net, Academic Press, San Diego, 61-73.
berpsychology and Behavior, 11, 731-733.
students. Computers in Human Behavior, 16, 13-29.
cial support. Cyberpsychology and Behavior, 5, 157-171. Journal of Web Based Communities, 4, 302-318. Hardie, E. and Tee, M.Y. (2007) Excessive Internet use. Emerging Technologies and Society, 5, 34-47.
loneliness. Cyberpsychology and Behavior, 4, 393-401. Journal of Psychology, 46, 288-298. Internet use. Cyberpsychology and Behavior, 11, 699-701.
cial well-being. Communication R es e a rch, 30, 625-648.
tional Journal of Nursing Studies, 43, 185-192.
depressive symptoms among South Korean adolescents. 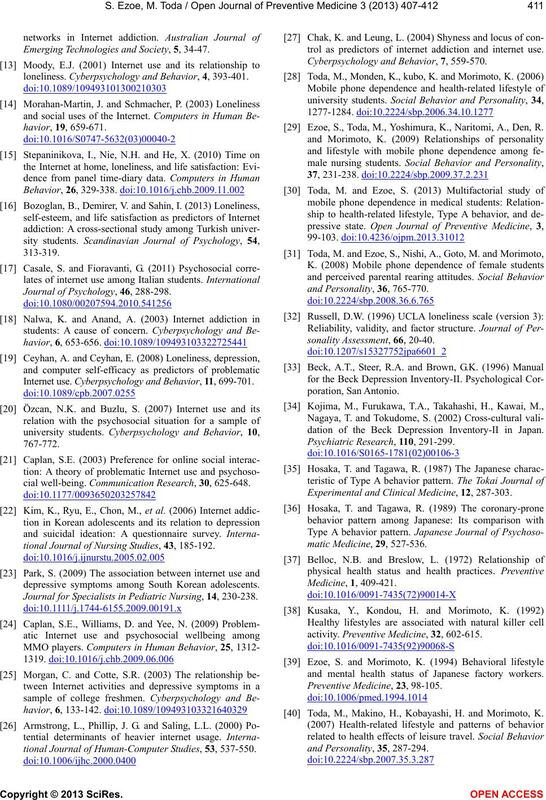 Journal for Specialists in Pediatric Nursing, 14, 230-238.
tional Journal of Human-Computer Studies, 53, 537-550.
trol as predictors of internet addiction and internet use. Cyberpsychology and Behavior, 7, 559-570.
sonality Assessment , 66, 20-40. Psychiatric Rese arch, 110, 291-299.
activity. Preventive Medicine, 32, 602-615. Information & Communication Statistics Database. in Human Behavior, 18, 553-575.